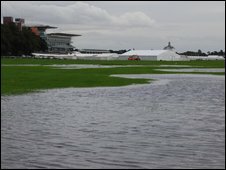 The second day of York racecourse's Ebor festival has been cancelled because of continued bad weather. The start of the event was abandoned earlier due to a waterlogged track. Organisers said further rain meant the track would not recover by Wednesday. The Met Office has issued a severe weather warning for North Yorkshire between 1500 BST and 2200 BST. The racecourse will be inspected on Wednesday to see if the rest of the four-day festival can go ahead. The festival is the biggest racing event in North Yorkshire. William Derby, racecourse chief executive, said: "This is hugely disappointing news for connections and race goers alike. "The continuing rainfall has not given the racetrack itself enough time to recover for Wednesday so we have made an early announcement." Mr Derby said any badges and tickets booked in advance for Tuesday and Wednesday would be refunded automatically. The organisers of hospitality parties will be contacted by the racecourse team.